Renault says production costs will be a big factor in deciding where to make the Clio. PARIS (Reuters) -- French President Nicolas Sarkozy grilled top managers of Renault on Saturday but failed to win pledges from them to center production of their new small car at a factory in France rather than in Turkey. French Industry Minister Christian Estrosi has heaped pressure on Renault to make cars destined for the French market at home, even suggesting the state could raise its 15 percent stake in the group to get a bigger say. At stake is where the new fourth-generation Clio, expected in 2013, will be produced. Renault is looking at sharing production out between a plant in Bursa, Turkey and Flins near Paris, with most of the work expected to go to the Turkish factory. Renault CEO Carlos Ghosn and chief operating officer Patrick Pelata talked for over an hour with Sarkozy and Estrosi on Saturday and left without making a comment to reporters waiting outside the Elysee palace. But a statement from the president's office suggested Sarkozy had been unsuccessful in convincing Renault's management to locate the lion's share of the new Clio work in France. It said only that Ghosn had agreed to keep some jobs at the Flins plant and would make both electrical and fossil-fuel cars there in the future. Renault was privatized in 1996. In addition to the French government's stake, Japanese ally Nissan Motor Co. has 15 percent of the company. In February last year, France provided three billion euros ($4.33 billion) each to Renault and rival PSA/Peugeot-Citroen in five year bonds, at a rate of six percent, to finance investments into clean vehicle production. In return, the carmakers agreed to avoid slashing jobs in 2009. European Competition Commissioner Neelie Kroes said on Thursday that she would study again whether there were hidden conditions attached to these loans that limited the companies' freedom to conduct their business. On Wednesday, Pelata said the Turkish plant would not be able to handle all the production of the new Clio and that Renault was studying how to spread it between Bursa and Flins. Renault has said, however, that production costs will be a big factor in the decision where to build the car and Ghosn pointed out back in 2008 that France had higher business taxes than Spain or Turkey. 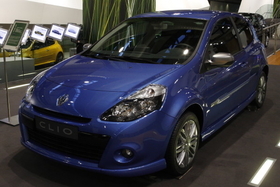 Renault makes 180,000 Clio cars per year in Turkey and some 125,000 in Flins.